This month Happy Star’s two Heavy Lift Mast Cranes were upgraded to 1,100 mt lifting capacity each at the Huisman Service & Assembly location in Schiedam, the Netherlands. After a thorough testing programme, Happy Star will depart for Porto Maghera, Italy, tomorrow to load two 1,500 mt reactors – the first commercial cargo to be lifted with her upgraded cranes. BigLift has noticed a growing demand for heavy lift vessels with lifting capacities of over 2,000 mt. With the crane upgrade of Happy Star, BigLift has broadened its palette of shipping options, now offering crane capacities up to 2,200 mt in tandem lift. The cranes themselves kept their unrivalled lifting height and outreach. A fly jib can still be used for extra outreach. The further functionalities to operate the cranes even more efficiently and safely, such as man riding, offshore load curves and an anti-collision system, were installed or upgraded. 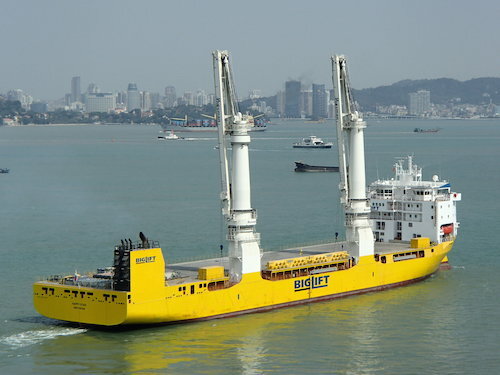 The modification went exactly as planned and BigLift has complete faith that Happy Star will keep on meeting the expectations of being the flagship of a leading heavy lift shipping company. 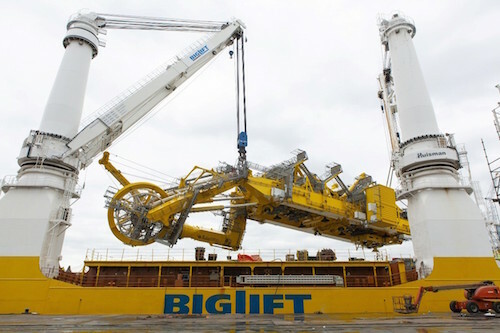 BigLift Shipping – member of Spliethoff Group – is a world leading heavy lift shipping company with a history dating back to 1973. BigLift’s fleet consists of 14 modern heavy lift vessels with lifting capacities up to 2,200 mt, and two state-of-the-art heavy transport (MC-Class) vessels. The MC-Class vessels, with their large 125 x 42 metre deck, have increased BigLift’s shipping capabilities for ro-ro cargoes with some 16.000 mt a piece.